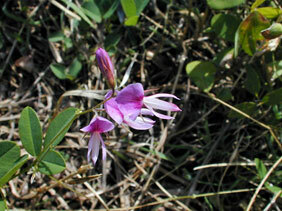 Lespedeza violacea (L. ) Pers. Stems: Weakly erect or trailing, several from base, often finely branched, sparsely pubescent. Leaves: Alternate, pinnately trifoliolate, smaller leaves in axils of larger leaves; stalks of main leaves .5 to 1.5 inches long; terminal leaflet somewhat apart from lateral leaflets; leaflets elliptic, oval, or broadly oblong, 1 to 2 inches long, about 1/2 to 1 inch wide, pale green and sparingly flattened-hairy below, mostly glabrous above; stipules filiform, up to 1/4 inch long. Inflorescences: Flowers of 2 types; those with petals in racemes less than 2 inches long, loosely few-flowered; those without petals inconspicuous, clustered in axils. Flowers: Stalks up to 1/4 inch long; calyx 1/12 to 1/4 inch long, 5-lobed, upper 2 lobes joined above middle; corolla purple to rose-lavender, 1/4 to 2/5 inch long; keel longer than banner and wing petals. Fruits: Pod, egg-shaped, up to 1/4 inch long, tapering at both ends, flat, finely-pubescent or nearly glabrous; seed olive or brown, smooth. Habitat: Edges of open upland woods, thickets, rocky prairies, and roadsides; dry, rocky soils. Forage Value: White-tailed deer eat prairie lespedeza.